According to the Chronicle's energy blog, the current owner of Bullwinkle, Superior Energy Services, is planning to decommission Bullwinkle. This is the big story in the gulf. The comeback of shallow water. Just deeper this time. Very rad picture. I wonder what that channel is? The cut out of Freeport/Surfside Beach? But where is the jetty? Did all those cars show up just for the platform passage? Texans *sigh*. 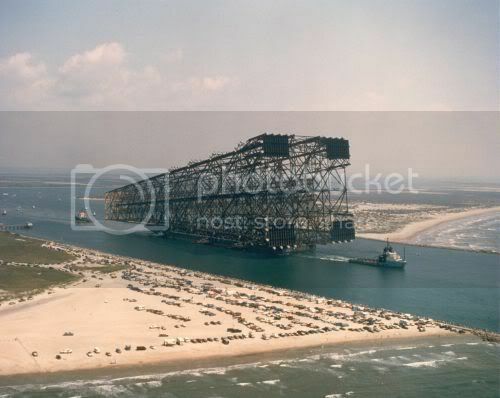 I'm not sure where it is, Sabine Pass, maybe, but it is for sure not Freeport. I think I would have noticed it in the harbor, number one, and number two - you can't see Surfside or Quintana. And you would, from that angle. I don't know where that picture was taken, but I know roughly when--1987. Maybe that will help identify where?